Ahead of it’s November 2016 release, Shout! Factory has revealed the finalized cover art for the Chouriki Sentai Ohranger Complete Series DVD Set! Revealed in post card form at last weeks San Diego Comic Con, this is the first proper official image look we’ve had for this release. So are you more excited for this DVD release now? What are your thoughts on the cover art this go around? Sound off and let us know in the comments below! Shout! Factory Confirms Chouriki Sentai Ohranger Complete Series DVD Set! Revealed during today’s marathon stream of Gosei Sentai Dairanger on ShoutFactoryTV, Shout! Factory’s next Super Sentai DVD release is none other than Chouriki Sentai Ohranger! Chouriki Sentai Ohranger The Complete Series is set for release this November and pricing is of course going to be very similar to what we’ve seen from the last 3 Super Sentai sets from Shout. 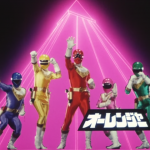 Zyuranger, Dairanger, Kakuranger, & now Ohranger all available with full official subtitles. Is there anything better? Are you excited by the chance to own yet another complete Super Sentai series officially subtitled? If this sells well will we get Gekisou Sentai Carranger? We certainly hope so! Let the wonderful folks at Shout! Factory know how excited you are! Before it was known as Power Rangers Zeo it was Cho-Riki Sentai OhRanger, a series designed to pay homage to old military shows and featured every series head writer for the previous Super Sentai seasons as contributors to the scripts of OhRanger. Sadly, the Aum Shinrikyo terrorist cult attacked the Japanese subway system, releasing tear gas that killed 15 individuals and injured another 30. Their leader’s thoughts closely aligned to what OhRanger‘s story line was intended to be (an ancient civilization giving super powers to people of today) and the show’s direction was scrapped and the series re-written, becoming one of the least successful and least popular Super Sentai shows of its time. But thanks to Millionfold Curiosity FanSubs, and the ever popular translator MegaAnon, the series Cho-Riki Sentai OhRanger is now being subtitled and released to fans around the world. This is an incredibly excellent chance to catch a series that, as far as I know, was either never subtitled in its entirety or was long ago and has since been lost (or it was just a bad sub/bad quality video). Click here to go to MillionFold Curiosity FanSub’s release of Cho-Riki Sentai OhRanger! And be sure to discuss your thoughts on this show (which changed themes due to the terrorist attack somewhere around Episode 8 or Episode 9) on our discussion thread linked to this post! OhRed actor opens his own Toku bar! Video games website Kotaku has posted a feature on actor Masaru Shishido (aka Goro Hoshino/OhRed from Chouriki Sentai Ohranger), who has recently opened his own tokusatsu bar in the Tachikawa district of Tokyo! The bar is packed full of Super Sentai memorabilia, with bartenders referring to each other in an Ohranger style, using names like “taichou” (commander) and “captain”.